Do you play with other musicians? Confused with tunings? Then you need this app! Simply select the tuning of the first instrument and key they are playing in. Next select the tuning of the other instrument(s). Instrument Transposer will instantly show you what key(s) you need to play in. * Wide range of instruments to cover different tunings. 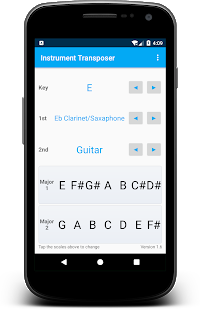 * Also shows all instrument's scales lined up so you can quickly transpose music as needed. 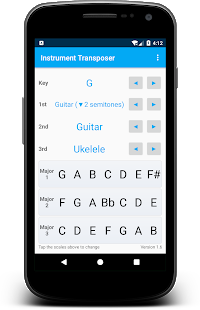 * Can quickly change between Major and Minor scale view. * Can be used portrait or landscape. * Bonus - Guitarists can use this to work out limited capo positions.